by Keefe Bohannan, Keysight Technologies, Inc.
Persisting trends in current and next-generation communication systems create strong demand for multi-mode, multi-band, multi-function modules. Engineers are faced with the challenge of overcoming spectral coexistence issues, along with fixed-space limitations on the service providers’ application printed circuit boards. Legacy methodologies for designing the assembled Multi-Chip-Modules (MCMs) involve a variety of design flows for various technologies (e.g., III-V compounds, Silicon, ceramics, and organics) and functions (e.g., amplifiers, acoustic devices, embedded passives, SMD components, and more). While such an approach can yield functional designs, employing an integrated design solution is critical to improve performance, design cycle efficiency, and ultimately, time-to-market. Furthermore, an integrated design methodology provides more predictive confidence, improving on the risks associated with fractured stand-alone design flows that are often employed. To better understand how an integrated Electronic Design Automation (EDA) design flow might be utilized in the real world, let’s closely examine the design of high-performance RF modules. Beginning with the end result in mind, consider examples of MCM products already commercially available. These MCMs were designed utilizing an integrated design flow to be presented later in the article. Results for a Skyworks power amplifier (PA) module  and for a TDK-Epcos front-end module  are included in Figures 1 and 2, respectively. In both cases, good agreement is seen between the simulation results and the measurement data for these complex structures. Figure 1: Comparison of swept-input-power measurements versus ADS simulations (using various levels of detailed EM modeling) for a Skyworks PA module. An image of such a module is also included. 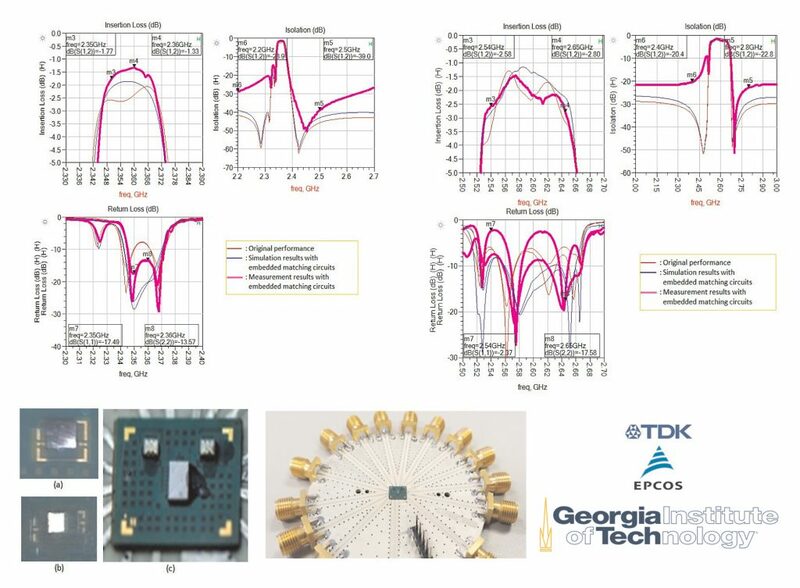 Figure 2: Comparison of measurement and ADS co-simulation results for low-band and high-band acoustic filters on an integrated TDK-Epcos RF front-end module. Images for the filters, module, and test fixture are also shown. Key complexities in the design of these modules included: (1) integrating various technologies, such as CMOS controller, III-V amplifier, and laminate assembly for the PA module, and acoustic filter and switch technologies for the front-end module, (2) potentially disparate design flows for a subset of those technologies, and (3) embedded passives and interconnects, along with SMD passive components that also needed to be included in the fully assembled module. Further complicating matters is the fact that each must be simulated in conjunction with the other designs. These complications result in the need to consider many challenges. How can as much critical functionality be included in a fixed footprint and volume? How can high performance requirements be maintained within these physical constraints? How can the impact of one function of the module on another be accurately predicted? Which key parameters, dimensions, etc. can be changed to optimize both block-level and full-module function? And, does the designer have the time to address this level of complexity? A consideration of the design complexities and challenges listed above leads to two options for the design engineer. The first option is to employ a fully-integrated design flow solution that can natively support all of the technologies, although this is sometimes not feasible if customized application-specific tools have been used. The other option is to enable a more integrated methodology using importers, seamless platform integration, and native capabilities to leverage the existing application-specific tool sets. 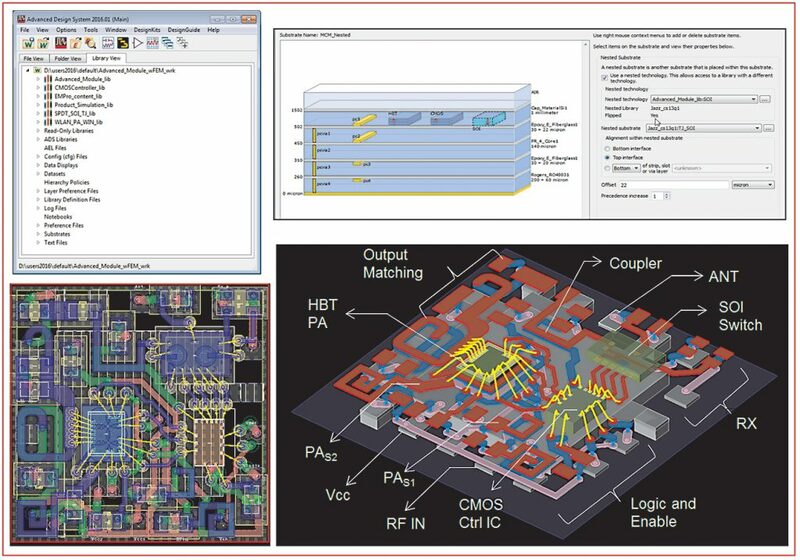 For the purposes of designing the multi-technology modules presented here, the Keysight EEsof EDA Advanced Design System (ADS)  and EMPro  integrated platforms were utilized. Both offer the ability to capture and optimize the performance of this class of modules. Inclusion of physical effects (coupling, loss, radiation, substrate effects) for all physical aspects of the design, including component artwork, embedded passives, bondwires, pillars, etc. Both industry-standard and custom analytical models for active devices, SMD components, etc. 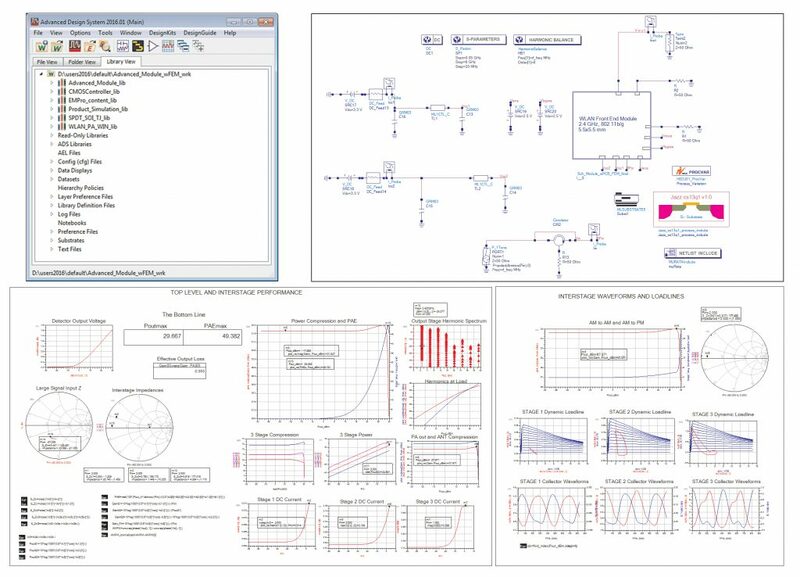 A capable, home-base solution like this not only provides the ability to design the full RF MCM natively, but also allows designers to easily incorporate design content from other specialty point tools. For the variety of MCMs examined, ADS served as that unifying platform. Whatever solution is utilized for this purpose, it must offer schematic, layout, DRC, and LVS capabilities for the RF component design, as well as for the fully-assembled module level. In the case of ADS, this makes it possible to construct and assess the performance of MCMs with connectivity verification tools (in both 2D and 3D), 3D FEM simulations, and comprehensive linear and nonlinear EM/circuit co-simulations. Silicon and acoustic device content could potentially be designed within ADS or in an external tool to the module assembly flow. If designed in a custom or specialty tool, analytical models or 2D design content may be directly imported into ADS, while any 3D content may easily be imported into the EMPro full-3D platform. Any content imported into EMPro may then be saved as an Open Access (OA) library. Any OA library from EMPro may then be added to the ADS workspace and included in the MCM assembly as a flip-chip connected with copper pillars or affixed with bondwires. Native design content in ADS will typically include the MCM laminate design (embedded passives, interconnects, and SMD components), along with the bondwire connections or copper pillars that form connections to the amplifier die, which is designed using the full front-to-back flow in ADS. Full EM, circuit, EM/Circuit co-simulation and co-optimization capabilities are then exercised in ADS for both performance and yield optimization. This integrated flow may be demonstrated using a number of public domain examples. However, in this case, a PA MCM example will be leveraged for the ensuing illustrations. Figures 3 and 4 capture some of the most relevant content in the integrated workspace for this sample PA MCM. Multiple libraries are included, enabling seamless access to content in native design libraries, Foundry Process Design Kits (PDKs), an EMPro design library, and SMD vendor component libraries. The physical stack-up editor allows the designer to combine multiple technologies easily with Nested Technology options. Both 2D and 3D views of the artwork in the resulting layout window may be seen, and various connectivity and verification tools could be employed. An EM model for the entire MCM physical structure, created with ADS FEM, was then included in the top-level EM/circuit co-simulation schematic test bench. In this specific case, both linear S-parameter and nonlinear harmonic balance simulations were run. Some of the figures-of-merit included in the results are shown in Figure 4. Further analysis and design optimization could be leveraged, as was achieved with an LNA module. Statistical simulation that resulted in design optimization for improved yield was run for this Keysight LNA (bond wired to a QFN package). A comparison of the simulation results to measured data for this component are shown in Figure 5. 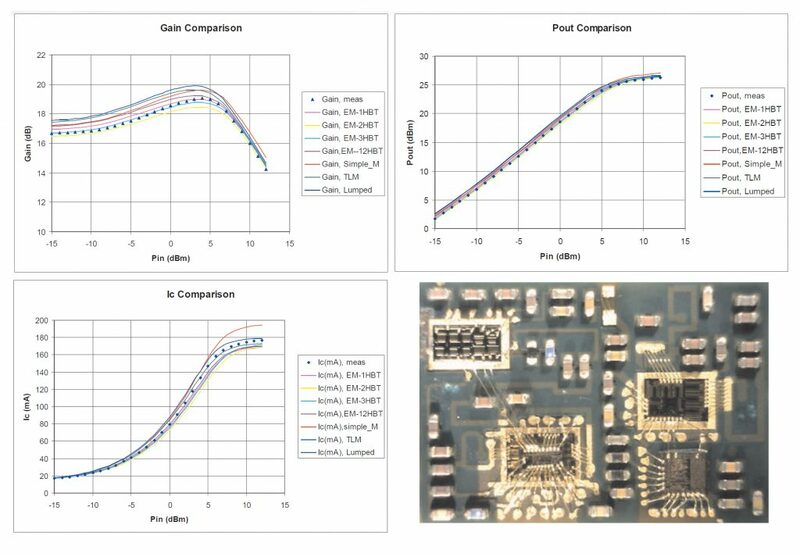 The comparison between simulation and measurement, which showcases high performance that was accurately predicted by the EDA solution, provides further validation of this design methodology. An overview of a fully-integrated design flow was used to demonstrate a viable solution for the assembly and design optimization of multiple RF MCM products. Measurement data provided confidence in the simulation accuracy predicted and was also used to validate the overall flow. The success of this example shows there is clear value in tackling MCM design challenges using an integrated design flow. Keefe Bohannan is an Applications Engineer District Manager for Keysight EEsof EDA and has worked with the company for over 15 years. Bohannan has worked in the RF/microwave community for more than 20 years and holds a B.S. in Electrical Engineering from the Georgia Institute of Technology. End-to-End Design and Simulation of Handset PA Modules, P. Zampardi and H. Shao, guest presenters for the Agilent Technologies Innovations in EDA Webcast Series, March 2012. J. Min, Z. Wu, M. R. Pulugurtha, V. Smet, V. Sundaram, A. Ravindran, C. Hoffman, and R. Tummala, “Modeling Design Fabrication and Demonstration of RF Front-End Module with Ultra-Thin Glass Substrate for LTE Applications,” in 2016 IEEE 66th Electronic Components and Technology Conference (ECTC), 2016, pp. 1297-1302.
tags: KEYSIGHT TECHNOLOGIES Keysight Technologies Inc.